WINNER! 'Best in Show Accessory' at 2012 Summer NAMM! Ideal for the professional, it works well for an advancing musician. Ultra lightweight and portable! Weighs just 10 ounces! 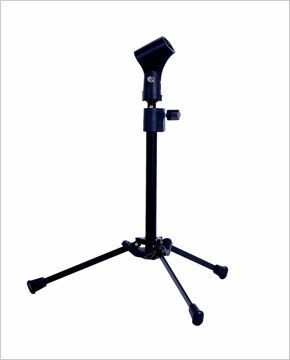 Unique design provides stability and lightweight, allows the center of gravity of heavy microphones to be over the center of the stand, reducing the likelihood of tip over. Ideal for conference room, desktop studio or performance. Includes a mic clip and carrying bag with additional accessory pouch. Offset adapter allows heavier microphones to be mounted with confidence. Adapter can be used as a stereo mic bar. Includes a mic clip, mounting hardware and carrying bag with additional accessory pouch. Value pack of KB810 Table Top Mic Stand and KB816M Universal Offset Adapter. Supplied with carrying bag and mic clip.